ProVitaMin is an ultra-concentrated oral drench containing 26 broad spectrum elements providing all the essential chelated minerals, vitamins and trace elements. Particularly useful for cows pre-calving, cows pre-serving, flushing, calves and beef cattle. 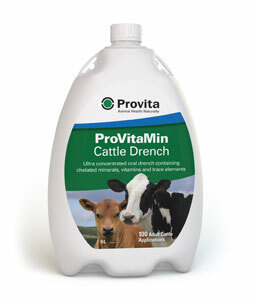 Designed to improve fertility, growth performance and thriftiness in cattle. Highly concentrated formula, 50ml application for an adult cow. From £1.89p per application (5L x 100 applications).